Last night I went to my favorite theater with my best friend to watch Jersey Boys. As soon as I saw the preview for this film, I knew I had to see it in theaters because I noticed that Clint Eastwood is the director. While I am a fairly young girl, I absolutely love Clint Eastwood. His charm and classic persona and movies tend to be so moving, and I knew Jersey Boys would be no different. 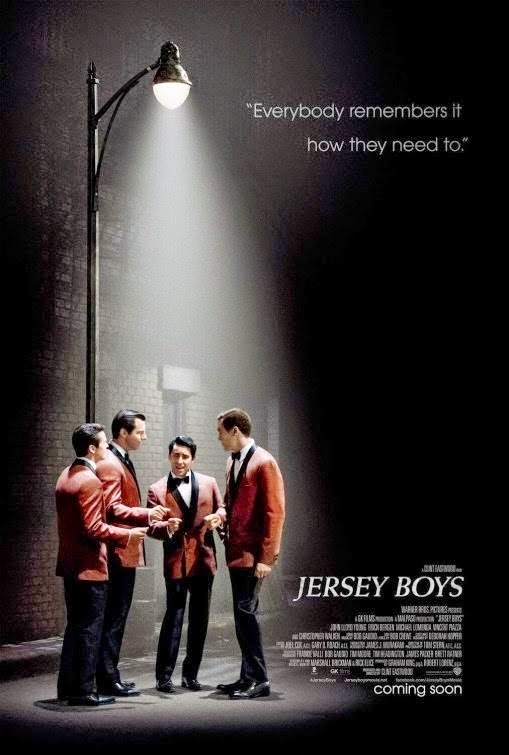 Jersey Boys is a huge hit on Broadway, and it has been for several years now. I hoped the movie would live up to its standards, and I have to say, I think it did. Jersey Boys follows the true story of Frankie Valli and The Four Seasons from living in a rough side of town and trying to make it out on their rise to fame. Along the way, they struggle with society as well as women, money, and social issues with the mafia. The film does have many dark moments, however, Clint did a fabulous job of adding touches of humor throughout the movie which made it great. The actors in this film did a phenomenal job of recreating the moments in these iconic singers lives. I felt sympathy for them at times in the film because their emotions were able to grab the audiences effectively. My favorite was Vincent Piazza as Tommy DeVito, who also narrated the film. His wittiness ( and thick New Jersey accent) really made his character appealing. Christopher Walken also did an amazing job on his character. The detail in creating the 1950’s in New Jersey was incredible! The costumes were crisp and classy, just like they were back in the day, and I enjoyed being taken back to those times when everyone dressed to the nines no matter where they were going, and seeing the classic cars lined up all along the street. From the props to the constant smoking of cigarettes, the detail that was infused in this film is particularly exceptional. The best part of the film was definitely the music. There were several times my honey had to give me the ‘stare’ which told me I was being too loud. I couldn’t help it! The songs were so great, I just had to sing along. The most interesting fact is that the actors were all singing live throughout the whole production! The voices were not replicated by the original group. Another interesting fact is that three out of the four men in the group are actual broadway stars from the original play, so they were well rounded and knew the material before they started producing the movie. The talent these boys delivered was truly phenomenal. This film is rated R for language. I wouldn’t recommend bringing any little ones to this film due to the vulgarity of the language. I rate this film five out of five stars! Have you seen Jersey Boys? What did you think of it? Comment below! Disclosure: I do not own any of the pictures above. All opinions are my own.